Some of the most destructive rodents to homes are rats. These small creatures are capable of causing serious harm to the integrity of the home and make life extremely challenging for homeowners that have to deal with them. 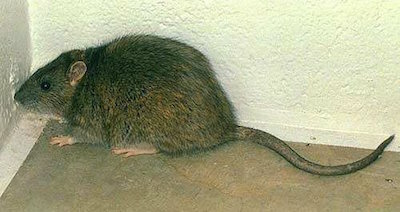 There are several types of rat species, but there are two primary types that live in North America and are commonly found in the Pacific Northwest. They are the Roof rat and the Norway rat. Roof rats, or sometimes called black rats, according to the University of California have a pointed nose, large eyes, large ears, a light and slender body, and a tail that is longer then their body (See Link). There more slender bodies allow them to navigate tree branches, power lines and tall bushes at higher altitudes with relative ease. Their longer tail helps them maintain their balance while they traverse narrow walk ways to potential home sites. Roof rats tend to make their their home in attics or walls of homes. They find these locations by climbing up to the roof in order to find an entrance into the home. Their presence in the home can cause damage to the insulation in the walls or attic of a home. Furthermore, by their repeated entry into the home, they can create a way for rain or other debris from outside to get into your home. Norway rats, or also commonly called the brown rat or sewer rat are more ground bound then the roof rats. They have a more blunted nose, smaller eyes, smaller ears, stocky body that is typically gray or brown, and have a tail that is shorter then their body length. They have a larger body to help them stay warmer since they are closer to the ground. These rats will make there home anywhere they have access to moist ground and the ability to burrow to a safe nest. These rats make their home under ground and there nests are typically found in a foundation of a home but could also be found in gardens, wood piles or fields. They will burrow in the foundations to create a living space for their family. They will gather fibrous material such as paper or cloth to build their nest. If a rat is able to build their nest under your foundation and dig around the foundation you could potentially experience significant risk to you home in the form or cracks in the foundation or settling of the home. In addition to the potential risk to the home structure there is also the damage to other aspects of the home such as the food supply or water sources. Rats will find a way to access food in the home if left undetected or in check. This means that rats will enter a home to look for food which will contaminate the food in the home. If you are experiencing rats in your home it is time to work with a professional to help eliminate them from your home. Contact us today so that we can help you take control of your home.